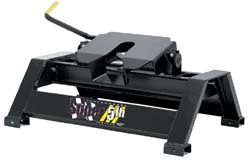 All RV Super 5th & RV SuperGlide hitches feature PullRite’s unique gear driven rotary latch, with automatic locking mechanism, for a safer, tighter connection between the truck and trailer. 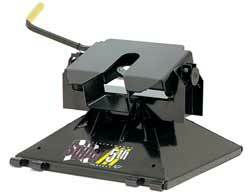 All RV Super 5th and RV SuperGlide hitches also have a full double pivot, fully articulating head. The rotary latch wraps 140° around the king pin, reducing wear, and minimizing “bump”, allowing only .030" tolerance between king pin and latch. 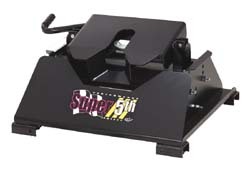 The 16K and 20.5K RV Super 5th hitches have a plate height that is adjustable from 14-1/2" to 17-1/2". (16,000 lb. Model - 4,000 pin weight capacity. The 20,500 Model - 5,125 pin weight capacity). 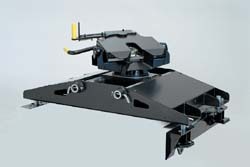 Choose Universal Mounting Kit - or new custom designed for specific vehicle. SuperBracket Mounting Kits for a stronger, more stable towing platform, and easier installation, or the SuperRail Mounting Kit with totally removable base rails and custom designed mounting brackets (each kit sold separately).